Natural Healing Tools: Spring Break? Take along a Natural First Aid Kit! Spring Break? Take along a Natural First Aid Kit! Unless you are working on your merit badge, it’s probably been awhile since you've thought about a first-aid kit. But it's top of mind when you are preparing for Spring Break, you can bet that the last thing we think to pack - but first thing we look for is that first aid kit. Do we own such a thing? Did we leave it in the trunk? Or (gasp) forget it at home? 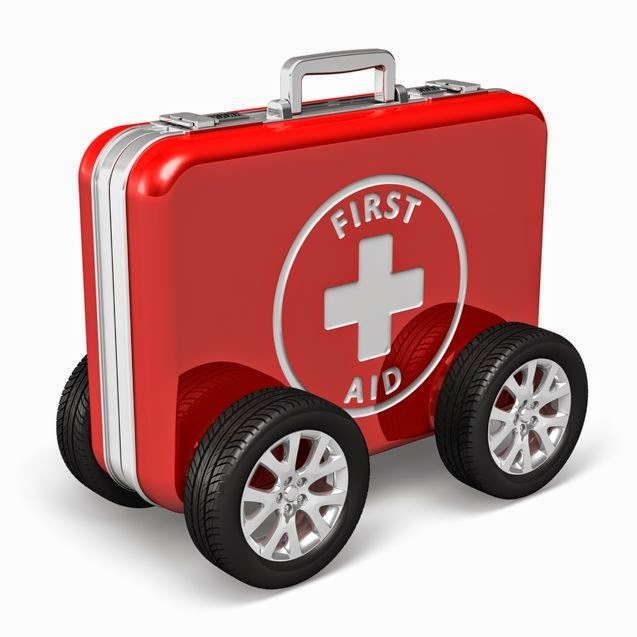 Before traveling, think about your first aid kit. You don’t have to buy those ready-made ones, though. Particularly if you've grown used to herbal and alternative remedies at home, you don't want to be forced to buy drug store products in a pinch. Fortunately, you can easily make your own kit. Here are some things you may want to consider putting into it. No matter what you add, it’s definitely worth it to take the time to put one together. In fact, consider creating a few—one for the car, one for the home, one for specific activities (hiking, skiing, camping...), and maybe even for the office. The first thing you need it a kit or case to put everything in. What kind of case depends on whether you’re traveling by air or by road, and how many people are in your family. It can be made of anything you choose—just be sure that it will contain the items in case anything leaks, and that it’s sturdy enough to survive abuse. Second, check ahead if you'll have cell service (if in doubt, write up a list of key numbers). Make sure your phone numbers for medical professionals, insurance and family members are organized. The third thing all kits need is key medications for family members. If someone in the family is an asthmatic, for instance, you may want to include an inhaler. If someone has serious allergies, an Epi-pen and antihistamines may be a good idea. Make sure to pack your tools! Scissors, knife, tweezers, latex gloves, hand sanitizer, and handi wipes. Toss in emergency batteries, electrical tape and whistle. Of course, don’t forget the bandages. Add a variety of sizes, such as finger-sized up to large, 2 x 4.5″ options. Include gauze and first-aid tape for wrapping wounds. Aloe vera gel: It’s cooling and healing for all types of wounds, from burns to bites. Echinacea: It helps you avoid colds and flus while on the road. Great when mixed with vitamin C.
Goldenseal: Perfect for applying to open wounds to keep them from getting infected. In tincture form, it’s good for warding off traveler’s diarrhea. Tea tree oil: A powerful antiseptic, this oil can be used in many ways. Mix with propolis and apply to insect bites and rashes. Diluted in water, it’s perfect for disinfecting wounds. You can also use it as a mouthwash, as a gargle for sore throats, and to prevent fungal infections. Lavender: This is the soothing herb. It can help soothe headaches (apply to temples), muscle pain, and bug bites, and is especially useful in encouraging relaxation. Calendula: Another good one for healing wounds. Witch hazel: Use this for cleaning out wounds and insect bites. Ginger: Good for motion sickness and for soothing overall stomach upset. Yarrow: Good for diarrhea, cramps, and other stomach upset. Can also stop bleeding when sprinkled on minor wounds. Clove oil: This has a nice numbing activity that can work well on sore gums and teeth, and on skin irritations. Dilute in water first. Citronella based insect repellant: Nothing ruins a trip like a bad insect bite. You can also use peppermint, lemongrass, and geranium to repel pests. Arnica gel or cream: Excellent for sore muscles and bruises, but don’t apply to open wounds. You may also want to include a basic water filter, in case you’re caught in a spot where access to fresh water is limited. Include water purification tablets. Camping filters are perfect. A few space blankets to keep you warm may also come in handy. Some other essentials include candles, matches or a lighter, granola bars, a thermometer, and some rope. Chamomile tea: Promotes relaxation and relieves indigestion, and is great even for children. Cramp bark: Helps soothe muscle cramps, particularly menstrual cramps. Licorice tea: Perfect for sore throats, and can also ease constipation. Superglue: May not be natural but can be used to close a wound in an emergency. Baking Soda: Internally for stomach upset and externally for severe sunburn. Print off any instructions for medications or home remedies you'll need for your family. Don't rely on just your cell phone - you may not have service, it may get lost or the battery may be dead! Many of these products are available at Natural Healing Tools in our First Aid section. Safe travels!